Canes allow people, who struggle to walk, to support their weight. There are many advantages of canes over other walk assist handicap devices. For one, they are highly portable. Many canes are retractable so they can be stored in a small location. The problem with standard canes is that there is not always a place to put down or lean the canes when you do not need them. Luckily, there are mobility canes that can stand up on their own. Standard walking canes have a long history. Some of the older and more simplistic canes are merely sticks that are held by the patient. Some have a hook on one end to assist the patient in grasping the device. However, more canes are now made out of metal, which is a more sturdy device. Given that some flooring surfaces can be scratched by a cane, some have padding on one end to protect the floor. One type of cane that takes some of these features into consideration while providing added stability are the quad feet canes. They have four feet at the bottom instead of one and often have balls on the tips. They can be placed anywhere since they stand up on their own. Quad feet canes are great in situations like putting it next to a couch, standing it up when you are using the toilet, or when you need both hands to hold something. Do you have a standard cane but require a larger base and do not want to spend extra money to buy another cane? Make your own canes that stand alone without help. There are large and wide base safety cane tips that can be easily installed to your regular cane. They are made of a lightweight rubber mold that stays on the end of the cane. The rubber texture adds friction when placed on a smooth floor surface resulting in a stable cane. Installation is fast and simple. Put the cane into the hole of the rubber mold base and push down. Now you created a cane that stands up on its own. There are also canes already built in with a larger base if that is what you need. Large Base Canes – Wide base cane with 4 feet for extra support. Stand Alone Canes Addons – Cane tip addon with a 3 inch wide rubber base with heavy duty construction. More affordable if you already have a standard cane. Canes are used by a broad range of people with balance issues. Many of the elderly do not need handicapped walkers or wheelchairs, but occasionally find it difficult to remain balanced and walk without assistance. However, canes are also useful for those who are recovering from an injury who want to place some weight on their legs and regain a sense of balance, especially after a stroke or traumatic brain injury. Another great advantage to having canes that stand up alone is when the cane falls to the floor. It becomes difficult or impossible for someone who has trouble bending at the waist or knees to pick up the object. At this point, you would have to ask or wait for assistance. This unfortunate situation does happen and can be solved with a cane that can stand up. Patients using canes should redistribute weight away from the painful leg and onto the cane. For example, if the patient has a right leg that is injured, the patient should hold the cane in the right hand and should shift weight onto that hand. The adjustable canes or retractable canes have a telescoping effect and is shortened or lengthened by pulling on one end of the cane. Folding canes have an elastic cord inside and are extended by pulling the two parts of the cane apart. Some canes are as cheap as $5, while other canes are as expensive as $75. The two main factors that drive up the cost of a cane are the adjustable features and decorative features. For example, some canes might have designs, be chrome plated and have an ornate handle. While these design features are not necessary, they can be fun to have. Quad Feet Canes – Provides extra stability and the ability to stand up on it’s own. You can put this cane down anywhere. Does not take up much space when not in use. This is a quad canes with a large base. Retractable Canes – Worry no more about finding a cane with the right height. These retractable canes are adjustable and work for short or tall folks. Padded Canes – These are canes with padding at the ends. Forearm Canes – They wrap around the forearm allowing your body weight to be distributed over the forearms rather than the wrists or hands. Metal Canes – If durability is a feature you are looking for in a walking cane, consider these tough canes able to handle the roughest of situations. 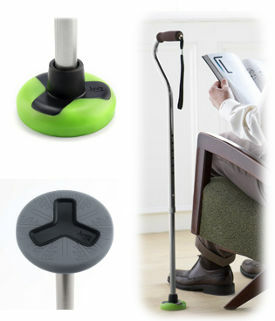 Patients who can mostly walk, but occasionally need extra stability, can use walking canes to increase their mobility.